While most High School students were lazily finishing up their summers, the cadets at Fishburne Military School were already hard at work. The Caissons’ Football, Soccer, and Cross Country athletes reported back to campus … In addition to these athletes, Cadets in consideration for leadership positions were invited to “Training Detail” week. On Thursday, August 20th, 2014, Cadet William C. Rowell of Chesapeake, Virginia was named as the Battalion Commander (BC) of Fishburne Military School for the 2014-2015 school year. Rowell, who will officially assume his duties during the military school’s First Formation on Tuesday (August 26, 2014), is the son of Mr. and Mrs. Simon Currey. 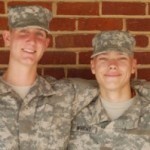 Most rising seniors get summer jobs such as lifeguarding, being a busboy at a restaurant, or counseling at a summer camp; however, Fishburne Seniors Cadet James Wright (Seattle, WA) and Logan Amico (Pittsgrove, NJ) wanted a more challenging experience. Fishburne Military School head postgraduate basketball coach Ed Huckaby announced the additions of Mel Abrams, Donte Hill and Steve Jecewiz to his coaching staff for the 2014-2015 academic year.